Last week the Chicago Democrat proposed a ban on fundraising for all state lawmakers and candidates while they're in session. He said he'd adhere to that principle this year, even though he's not in office. But Daley says Tuesday he's ‘corrected’ that. He says he's not an elected official yet so taking donations won't influence anything. Daley originally proposed the ban after his exploratory committee revealed that six constitutional officers, including three potential rivals for the governors office, raised over $2 million during a four month legislative session. 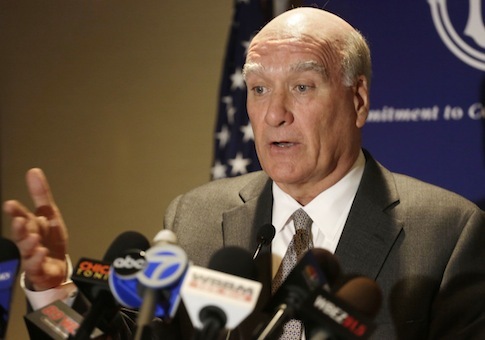 Refusing to accept political donations at this point would be "political grandstanding," according to Daley. Daley revealed in a tweet that his campaign received $800,000 in contributions over three weeks, more than current Illinois Gov. Pat Quinn (D.) was able to raise in three months. Daley served as chief of staff from 2011 to early 2012, a tenure marked by worsening relations between the White House and congressional Democrats. One of Daley’s first setbacks was the failed debt ceiling negotiation in July 2011 during which many Democrats in Congress turned on Obama. This entry was posted in Politics and tagged Bill Daley, Democratic Donors, Illinois, Obama Administration. Bookmark the permalink.